Create beautiful curls with the Electric Head Jog Gold Titanium Styling Wand 10-19mm, a conical curling tong with gold-titanium coated barrel to create smooth, shiny curls. 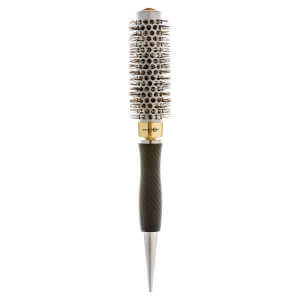 The conical wand creates professional-looking, voluptuous curls, from tight to loose and wavy, and its variable temperature control from 120°C to 230°C evenly distributes heat through the barrel for consistent results. The curling iron's safety cool tip keeps fingers protected during styling, and its 360° swivel 3 metre power cord make for easy handling. Variable temperature setting 120°C to 230°C. If you want tight curls then wrap small sections of hair tightly round the barrel and leave to curl for a few seconds. If you want looser curls then wrap wider sections. For a modern look don't wind the barrel up to the root. Leave a couple of inches straight at the root. Use a lower heat setting to create looser curls and wavy styles.